The nation of Panem resides in a place that was once known as North America. It is a Capital surrounded by 12 districts. Once, the districts rebelled against the Capital and were defeated. Thus, The Hunger Games were born. Every year, each district must send one boy and one girl between the ages of 12-18 to fight to the death in The Hunger Games, which is broadcasted across national television. 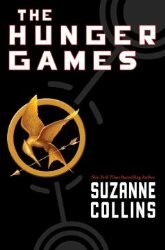 When Katniss' sister is chosen, she volunteers to go in her place, knowing that to go means certain death. I really enjoyed this book. I found it to be very interesting. It's scary to think that anybody would allow an event such as The Hunger Games to occur. Power in the wrong hands can lead to terrible things.